The De La Warr Pavilion (DLWP) in Bexhill wanted to engage with more diverse partners and participants. A recent Explore and Test grant offered them the opportunity to trial approaches which connected younger audiences with their heritage and programme. Ashley McCormick, Head of Learning & Participation, reflects on what they’ve learnt so far. We established a project named CONNECT, to shift the focus and shape of our projects with new partnerships. Our ideas about diversity and inclusion were tested, and we benefitted from genuine learning that we shared across the organisation and with new partners. One of the strands of CONNECT was around improving engagement with young people. Our original ideas developed through experimentation into what is now our Young Creatives programme, a new model of participation for DLWP. We had originally set out to recruit younger volunteers to deliver building tours, but for various reasons this proved unsuccessful, so we had to rethink the impulse to engage young people and foster exploratory and agile working practices. The ‘Explore and Test’ grant helped us to focus on learning, allowed us to admit when we got things wrong, reflect and do something different. Young Creatives emerged as a new model of participation. I worked with younger colleagues, including student Joshua Speer, who was on a work placement with us, and Learning & Participation Coordinator Grace Clements, to engage local young people aged 16 – 24 in a series of playful enquiries we called THE FUTURE. We set out to interrogate what the term ‘young’ means, unpick how young people identified themselves and test the appetite for a DLWP Youth Voice forum. We began by inviting DLWP staff aged 16-24 years and delivered further sessions with Hasting Youth Council (HYC) and Bexhill Sixth Form College students. The question ‘what is young?’ yielded fascinating responses, including (wildly) different age ranges, sensibilities, attitudes and ways of living. 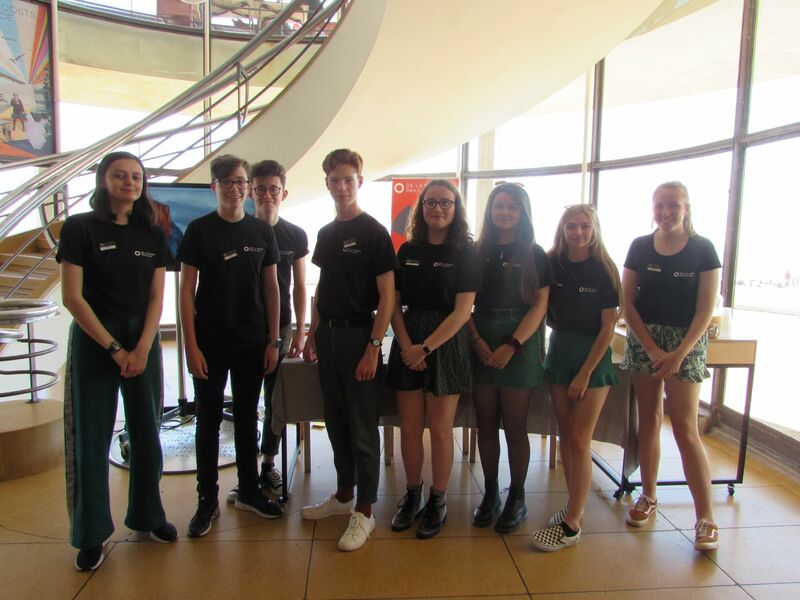 Enquiries went on to consider how young people identify with each other, how they spend their free time, and how they would spend money on DLWP programmes. Following these research sessions Grace was seconded to HYC for half a day per week over one year to develop skills, experience and confidence, and build relationships with, and a better understanding of the needs and concerns of, local young people. Only by listening to young people, were we able to shape relevant, meaningful opportunities for co-production and encourage them to seize agency. After 8 months, Grace began recruiting a new cohort of younger volunteers (14–21 years, as defined by research findings) to play a role in influencing DLWP. She invited Year 10 work experience students to progress to the group on completion of their work placements. She recruited from Bexhill Youth Council and Heart of Sidley Youth Media Group – a local group whose funding had come to an end, Hastings Youth Council and DLWP staff. Since October 2017, a group of fifteen young people aged 14-21 years have been meeting regularly. The Young Creatives have elected to conduct interviews with several DLWP staff members to gain a better insight to the organisation, how it works and how they might influence it, as well as learning about creative sector career paths. The Young Creatives; a collective of young people with an interest in creative practice. They are supported by the Pavilion and feedback on and inform the programme of exhibitions and events. Image courtesy DLWP. Working with artists they have co-produced public events at DLWP including Datamoshing, exploring ideas about identity, representation and visibility. Working with staff they have co-produced digital content including responses to the exhibition FANTOMAS and interviews with performers. They have also conducted ‘secret shopper’ research across commercial aspects of the organisation. In 2019 they are aiming to develop a manifesto, co-produce more events for their peers and pursue Gold Arts Awards. The Explore and Test grant allowed us to try new approaches, to learn by doing, fail, reflect, pivot and play. Our ideas about inclusion and participation were tested, and we benefitted from genuine learning that enabled us to rediscover DLWP’s prosocial foundations and values. We now have new partnerships, a more collaborative way of working internally, with better dialogue across departments, shared objectives, and improved monitoring and evaluation methods. We are keen to continue this more mindful, responsive method of co-production with new participants and partners including young mothers and refugee families.